I haven’t counted my perfume collection recently but I think it keeps hovering at about 60-70 bottles. I don’t count the various decants and samples, of course. There are three small boxes and one cute Angela Flanders shopping bag full of them. The thing about being a perfume collector, no scratch that, a perfume fan, is that one ends up with more perfume than any normal person could possibly use in a year. Scratch that again; I am sure many of the customers I used to serve in Harrods could go through more than a bottle of perfume a day (used liberally; given away as gifts). Us regular schmoes, then, regular, apart from our perfume obsession. We tend not to finish many bottles because our drawers, dressing tables or special perfume refridgerators are just overflowing with choice. Smaller bottles are better when you’re not hoarding one of your Holy Grails, because you don’t want to have a huge container of juice slowly deteriorating while you have affairs with 99 others. By the way, here’s a real tip: if you are running low on a fragrance and there is only very little of it left, use it fast. The more air there is above the juice, the faster the juice will deteriorate. 2013 was a highly irregular year for me in many ways – not least because I got back into actually wearing far more perfume than in the recent years (being in the lab at Lush meant a ban on wearing perfume during perfume making days – it really interferes with the work). Last year, I worked freelance, mostly from home, and could not only wear whatever I wanted, but in large quantities and in the foghorn and “whatever were you thinking?” categories without worry. (So one day I had the Clinique Aromatics Elixir candle burning whilst wearing Youth Dew. Another, I doused myself in the death-by-eugenol Gloria Vanderbilt that reminds me of good times behind a fragrance counter. I’m sure it used to be softer…). 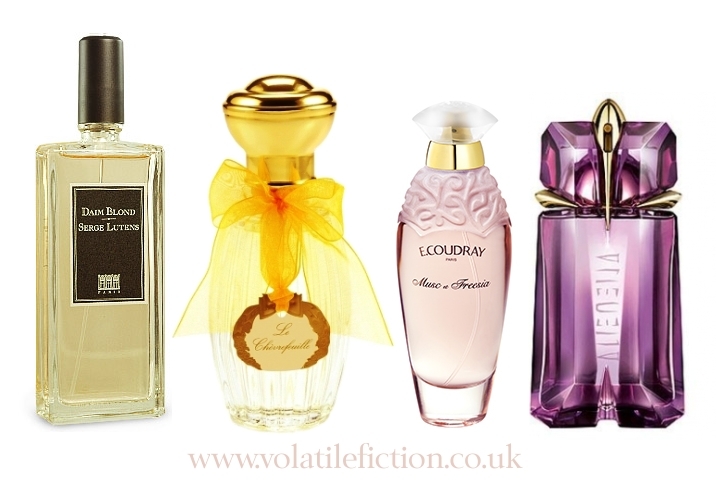 The perfumes I actually finished in 2013 are all in the easy-to-wear category – I could put any of them on for any occasion and not worry too much. It looks like Annick Goutal’s Mandragore has become one of my all-time favourites. I now seem to go through a bottle a year. Mostly a warm weather scent, it works any time. It’s just a perfect balance between fresh, sweet and herbal/spicy. Daim Blond has been my favourite from Serge Lutens since I first encountered it. I have many other scents from the range, too. I love the apricot-wrapped-in-suede effect of this scent and it just purrs on my skin. Le Chefrefeuille is too easy to finish fast because the longevity is just so poor. Not much you can do about that for a scent reminiscent of a flower stem but it’s still frustrating. Buing it feels like buying expensive eau de cologne; it isn’t really a perfume. E. Coudray’s Musc et Freesia has been in use for at least a couple of years now and last year just happened to be the one I finished it. Having said that, I went through a couple of weeks of wearing it almost every day. It’s powdery, a bit mumsy, but still elegant enough. Very easy to wear. Finally, Alien Edt – sufficiently different from the Edp to merit owning both, has featured so heavily in my rotation this year that I bought a 75ml bottle in the Escentual January sale to replace the one I’d used up. Others, well, I may not replace immediately because I was a very lucky woman and had three perfumes for Christmas: Elie Saab Le Parfum Intense, Iris Prima and a Molton Brown refreshing spritz. Regular readers might spot that two of those featured on my favourites list from last year’s discoveries. How does one get any real use out of so many bottles of perfume? It would be easy to forget many of them. I have a system. Every few weeks, I take out about a dozen bottles from my perfume drawer and display them on my dressing table. They’ll be what I will pick from for the next few weeks. The rest are stored away (and stay unspoilt for longer this way). The weather has been stormy but not cold and my “cold weather rotation” hasn’t quite taken off the way I had imagined. It seems that I now leave Alien Edt and Mandragore on the table no matter what, so that’ll be one reason why they get used more than the others. At the rate I’m going through it, I suspect the Elie Saab will feature in this year’s finished bottles (even though it’s the big bottle). How do you rotate your perfumes? Do you have enough to worry about that? Do you think there is such a thing as owning too many?